The Shibaoshan Scenic Area (aka Shibaoshan Nature Reserve ) is located in Jiangchuan County in the northwest section of the Dali-Bai Autonomous Prefecture, Yunnan province. Shibaoshan, also known as Shanbao Mountain (lit. Stone Treasure Mountain), is the southern branch of the Laojun Mountain ranges. It is the center part of the ‘Three Paralled Rivers”, a UNESCO World Nature Heritage Site. Its total area is about 25 square km. the landscape here is fascinating and beautiful. You may find different seasons in the mountain, and experience different weather within the distance fo a few kilometers, as the elevation changes (from 2140 m to 3038 m). Here “The Stone’s in Blossom” (the name of Shibao means ‘Stone Treasure’ in Chinese) matches very well with the natural landscape of red sandstone turtle – back stones from created by a century of rainwater. One could imagine some stone figures to be a stone lion, a flower or a bell. Besides, the Danxia landscape is the most picturesque view of all, and it keeps developing continuously. Shibao Mountain is located in the midst of a picturesque landscape, with a broad view consisting of row upon row of mountain peaks, tranquil valleys, dense green forest, clear springs, and deep-buried ancient temple houses created by skilled Bai workers and talented artisans. Shibao Mountain was designated as the first important National tourist scenic area in China by the State Council in 1982. Shibao Mountain is well known not only for its breathtaking landscape, but also for its marvelous grottoes. 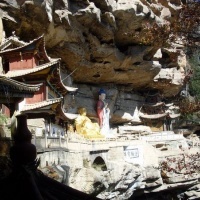 The Shizhongshan Grottoes, known as ‘the gem of the south in Yunnan’, were created by the ancient Bai People in the historical period of the Tang and Song dynasties ( 850 A.D – 1179A.D.). 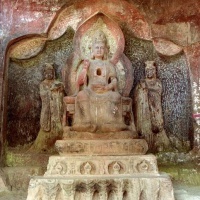 The figures carved in the grottoes, are the kings of the historical Nanzhao period of Yunnan. Buddhas, Boddhisattras, Guardian Kings, and even statues of foreign monks can be found here. Cave No. 6, the hall of the Heavenly Kings, was inspired by Esoteric Buddhism. This representation of the complete set of The Eight heavenly Kings is unique in China, and its form shows Tibetan and Indian influences. Cave No. 1 and No. 2 are a realistic representation of the political life at the Nanzhao court. It allows us to see anew the features and protocol of the King, servants and officials, their implements and their customs. Cave No. 8, Ayangbai (worship of the female reproductive organ), was displayed parallel with the holy Buddhas, Boddhisattras, and Kings. It is rarely seen in other historical sites in the world. The vivid portraits of the foreigners are a witness to the communication between Yunnan and other Asian countries in the old times. For its high value, the Shizhongshan Grottoes were listed as number one in the First Batch of National Major Cultural Relics under the State Protection level in 1961. The Baoxiang Temple Ancient Architectural Cluster, with the title of ‘Yunnan hanging Temple’, was constructed in the Yuan dynasty (around 1291 A.D.). This cluster is made up of the Baoxiang Temple, the Tongming Pavilion, Linqun’an and the Jingding Temple. For a long time, the eight scenic spots in Baoxiang Temple touched the hearts of many literary people, who sang its praises. The landscape here is some of the most beautiful in the entire scenic area. It attracts flocks of wild monkeys that have taken up residence there. 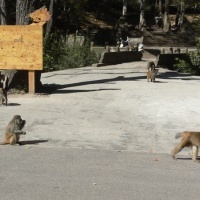 “Playing with the monkeys” in Baoxiang Temple can be one of the most interesting and fun activities in your tour. The Haiyunju Ancient Architectural Cluster: Haiyunju is regarded as a very tranquil place resting at the entrance of the mountain gate. 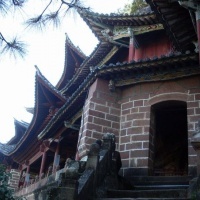 It was constructed at the end of Ming dynasty (around 1684 A.D.) the temple is hidden in the dense pine trees, and the old cypress trees kiss the sky. Some monks’ cemetery pagodas stand solemnly against the white wall of the temple. It’s the best place to spend your leisure time. The clusters were divided into two courtyards and three departments, but linked with each other tightly. Those made the building look simple but tidy and strong. It’s full of examples of the ancient Bai craftsmen’s high level of skill and talent. From the old time to now, Shibao Mountain has attracted many visitors, including the Great Chinese Travelers, Xuxiake of the Ming dynasty, the famous scholars, Yang shen’san and Li yuanyang, and also the high ranking monks Dandang and Dachu. In order to show their admiration for the famous Nountain, some of them wrote down the beautiful poems to praise Shibaoshan Mountain, which added luster to its fame. The Shibaoshan Music Festival, a Bai people’s special traditional festival, is held once a year at Shibaoshan Mountain. It lasts three days, from the 26th day of the seventh lunar month to the first day of the eighth lunar month. During the festival, you can enjoy Bai people singing songs in their native dialect to the melodies floating from three stringed instruments. Some scholars both from home and abroad titled it ‘China Sing Town’ or ‘Bai People’s St. Valentine’s Day.